Utility Stakes. Utility stakes are stakes that are often longer than the average hook tent stakes. But as a result; they also provide higher holding power. They are best for RV or car camping tours when weight and space aren’t an issue. V-stakes. V-stakes, as the name implies, come in the shape of V. Also, they’re popular because of their durability and excellent features that make them less likely to break. They are designed for hard and rocky ground. Nail stakes. Nail stakes are T-shaped stakes that allow you to secure your guy line easily to the stake. There is always a flat, even head whereas the rump has a sharp edge. They come with high-quality materials with a piece of plastic affixed to the head. Y-stakes. 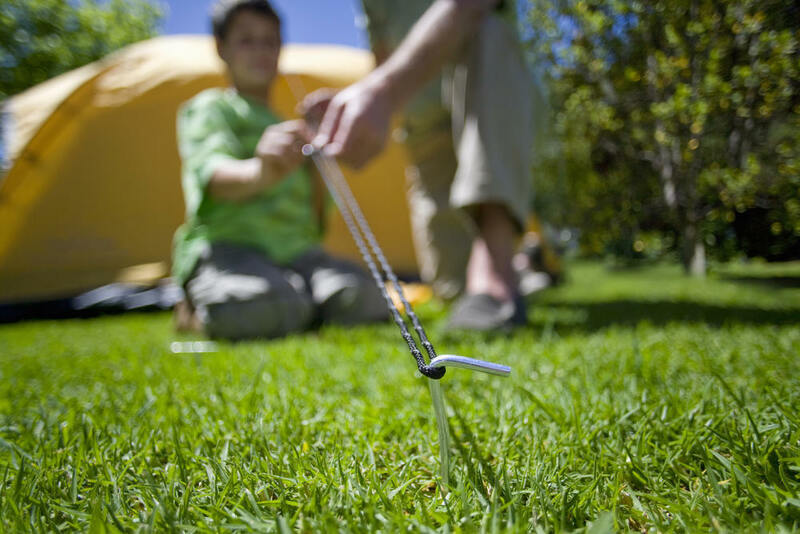 Y-stakes are one of the most preferred stakes by many campers because of its all-around terrain feature. If somebody can offer further higher cost point for a durable, sturdy, and all-around tent stake, then they should consider this stake! Snow stakes do not really indicate that they are ideal for snow only. These big, curved tent stakes include a hole that helps freeze them in position, giving you a huge holding power on the snow. The length is imperative in snow stakes. They are a bit heavy compared to the average tent stake. Picking the proper tent stakes to begin with knowing how you wish to use them. So if you are using them for backpacking or hiking where you will have to carry the tent stakes, we suggest that you choose the lightweight ones. For the kid’s backyard tent or occasional weekend trip, you may want to choose something sturdier and foolproof like the SE 9NRC10 Galvanized Non-Rust Tent Peg Stakes. These stakes can bore even within hard surfaces and rocks. Carbon fiber is lightweight, but it lacks the main feature of aluminum and steel – durability – in certain conditions. That is why the UCO StakeLight Tent Stake covered the Carbon Core tent stakes in aluminium. With that being said, they are still quite weaker than a similarly sized aluminium or steel stake. The same can be said of light titanium Vargo stakes. Titanium is very strong, but most titanium tent stakes are rather thin and can bend easily. Just be certain to check the user reviews and comments about the material you will be grabbing your tent stakes from. Steel is very durable and strong, but it is also very heavy. Every material has its strengths and weaknesses, and you will certainly be frustrated to fail in considering them before you buy. The UCO StakeLight Tent Stake is a one-of-a-kind stake with an incorporated LED light to give your area lighting. The 17 light lumens can aid you to find your site even at dark as well as alert fellow campers to tent guy lines. You can switch to strobe mode to find your tent over long distances. The StakeLight LED gives up to 24 hours of light in strobe mode or up to 10 hours of continuous light in area mode. The light is run by an AAA conventional battery and covered in water-resistant TPE housing. This product is made from sturdy, lightweight 6000-series aluminium. Every stake is nine inches long and weighs only 36 grams (1.3 ounces) without the battery. 17 light lumens for up to ten hours in area mode. Light flashing for up to 24 hours strobe mode. On/off switch is incorporated into the lens with a glows in the dark feature. Constructed from sturdy 6000 series aluminum. LED is enclosed in water-resistant TPE housing. LED can be removed easily and utilized separately. 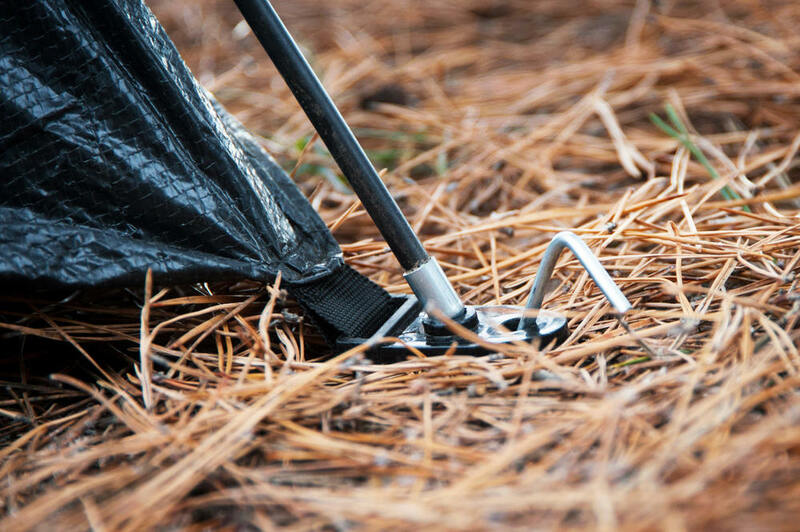 The MSR Groundhog is a great gear upgrade, with six durable and lightweight backpacking and camping tent stakes that can hold up to constant, repetitive pounding into various ground types. Its 3-sided, Y-beam design provides maximum penetration and holding power, thus guaranteeing that tents remain firmly staked out even in inclement weather conditions. The top’s notch hooks tent guy lines. The affixed reflective pull loop makes easy removal of stakes when it is time to leave. The MSR Groundhog includes six tent stakes. Every stake weighs 0.46 oz. and measures roughly 7.5 inches long with a limited three-year warranty. Some customers said the brand is too expensive for them. The Ti Shepherds Hook Stake Orange is one of the original shepherd’s hook designs featuring fluorescent orange-coated head for better visibility. The Ti Shepherds have boasted legendary durability and have been carried for thousands of miles around the world. Secure your tent with these original bestsellers – you will love the results. The plastic tip is prone to breaking when you hit on the stake too hard with a striking tool like the hammer. The SE 9NRC10 includes 20 Galvanized Non-Rust Peg Stakes and a Green Stopper that will hold strongly against heavy winds in sand, grass, dirt, and rocky soil – ideal for beach day, camping, sporting events, picnics, backyard sleepovers, and anywhere you have to fasten coverings, landscape trim, patio or garden structures, and more. The heads that glow are prone to breaking, so you need to be careful with them. The SE 910NRC10 is all you need to anchor a canopy or tent; it includes a 10-Pack Glow in the Dark Stopper, 10.5-inch will hold strong against heavy winds in the sand, grass, dirt, rocky soil, and every type of terrain. The bigger stopper’s head and sharp tip make it easier for you to drive the peg into the rocky and hard ground. Also, the stopper comes with a string eyelet for ropes, hook, and other anchoring options. Once the tent is secured, you can avoid stubbing your toe of tripping at night time with the glow-in-the-dark feature. It is ideal for beach trips, camping, backyard sleepovers, sporting events, picnics, and loads more. Some customers say the stakes don’t glow much. Place the tent stake tilted away from the tarp or tent at around 45 degrees. 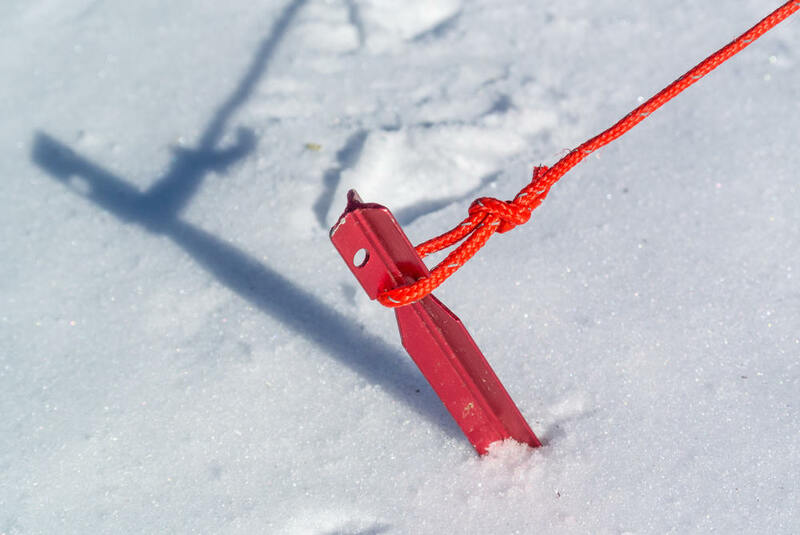 While holding the tent stake, utilize the toe of your boot or shoe to apply gentle pressure to the top portion of the stake until it buries into the ground while the head remains above the ground. If your tent stake will not bury into the ground, attempt to relocate to avoid rocks or roots and try once more. If the ground is as hard as concrete, you will have to utilize another method for burying your tent or utilize sturdier stakes you can hammer. After everything we’ve reviewed, you must have already chosen one among the best tent stakes for your camping adventure. While the products we’ve listed and reviewed are among the best in the market, the right choice will still depend on your needs and preferences. The SE 910NRC10 Metal Tent Peg is my second choice. It is a tough ground stake with milled points that can penetrate hard soil with ease. The head has enough surface area for one to hit with the hammer or mallet driver. Its tops come with a hook and eyelet that provides great anchoring capacity. We know you have your preference when it comes to these stakes and we want to remind you that shorter stakes may be lighter but longer stakes have more holding power. V-shaped and Y-shaped stakes have better holding capacity than hook and nail stakes because of their design, and that keeps them useful in windy conditions. Think also of weather and terrain where you will be camping before buying the right stake for you. No matter how great your stake is, certain conditions are beyond the capacity of its design to adapt. Check out your manufacturer’s recommendations for more information about your product. What are your thoughts on this comprehensive review? Maybe like one or several of the tent stakes reviewed on our list and are now thinking of buying them? Which one among the five best products would you like have for your next adventure? Feel free to give your thoughts on the comments. We would love to read your feedback and discuss the subject more with you. Learn more about how to choose The Best Tent Seam Sealer Review , The Best Tent Brands Of 2018: A Buyer’s Guide You Need To Know. By the way, have a look at our A Complete Guide To Buy The Best Pop Up Canopy .